Visit us online at CanadaPharmacyOnline.com and order Prometrium at the best price guaranteed. We currently have the brand name Prometrium from Canada manufactured by Schering. The generic Progesterone comes from India called Endogest manufactured by Cipla and Progestan manufactured by Kocak Pharma. Prometrium is available in the strength of 100mg and 200mg capsules. Browse through the largest selection of prescription and OTC medications online or call Customer Service at 1866-920-3784 for assistance. 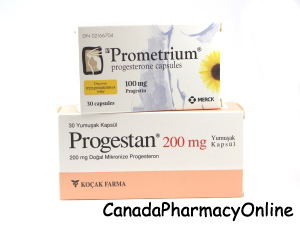 Prometrium (Progesterone) is a type of female hormone (progestin). This medication is similar to the progesterone that your body makes naturally and is given to replace the hormone when your body is not making enough of it. It is also used to treat women who have not had a menstrual period for several months. Progesterone works by changing the lining of the uterus. Prometrium is also used as part of combination hormone replacement therapy with estrogens to reduce menopause symptoms (hot flashes). This medication is added to estrogen replacement therapy to reduce the risk of cancer of the uterus. You should not use Progesterone if you are allergic to Prometrium. Before you start using this medication, talk to your doctor about your medical conditions and about all the medications you are currently taking including OTC and herbal medications. This medication may make you dizzy or drowsy. Do not drive, use machinery, or do any activity that requires you to be alert until you can perform such activities safely. Limit alcoholic beverages. This drug passes into breast milk.